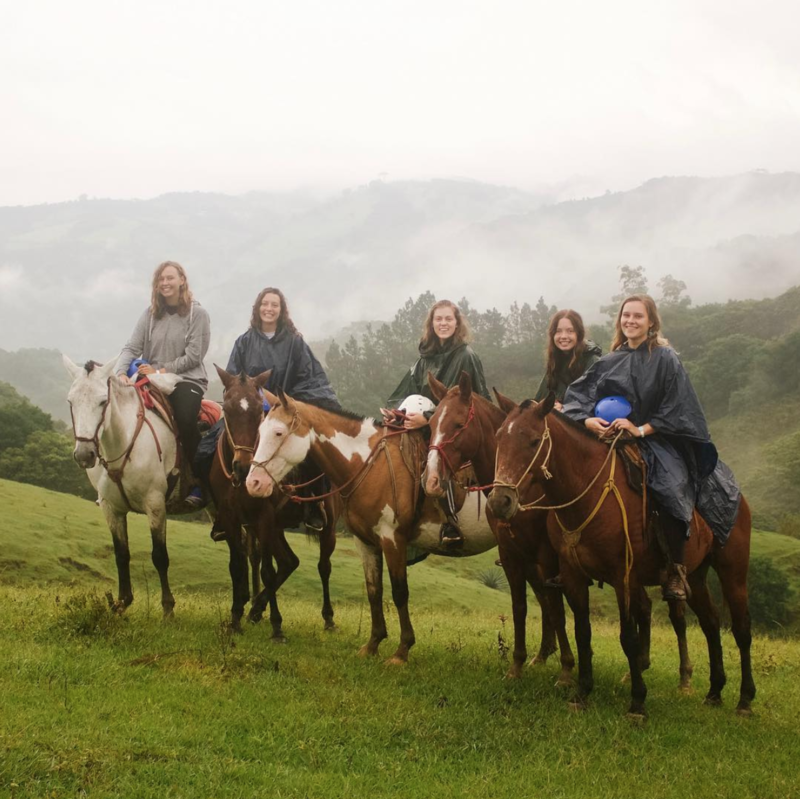 Especially if you'll be volunteering in Costa Rica or Nicaragua, you've got to spend about a weekend (or more) in Monteverde. ILP volunteers in our Central American humanitarian programs are there to make a difference; you’ll spend part of your day teaching English and connecting with these cute kiddos ... but that doesn’t mean you don’t have weekends off and time for vacationing to explore our favorite adventures in Costa Rica. Want to spend more time in Costa Rica? Get more info about volunteering in Central America here before filling out an application. Quick — spots go fast! You’re a bit spoilt for choice when it comes to ILP vacations in this part of the world (there are too many pretty beaches and rainforests). Even our ILP Nicaragua and ILP Mexico volunteers can hop over for a long weekend in Costa Rica, so no matter where you’re volunteering, you will want to add the dense rainforests of Monteverde on your “semester travel list”. What and Where Is Monteverde? How Do I Get To Monteverde? Head to the Puntarenas Province, in the north-west part of Costa Rica. The Monteverde area includes some surrounding towns plus an expansive and lush forest crammed full of towering treetops, suspended bridges that skim the skies, spectacular hikes, zooming zip lines, hidden waterfalls, jungle adventures, 500 kinds of orchids, and some of your favorite tropical animals, like jaguars, parrots and sloths. It's really one of those more famous places in Costa Rica - you can't go wrong here. That “cloud forest” means low-laying clouds create a mist that swirls in and above those tall leafy tree tops — basically, it’s gorgeous and one of the best places to explore in the Costa Rican jungle. There are three cloud forests in Monteverde. The Monteverde Cloud Forest is the most popular — you’ll want a full day here to explore all the trails and viewpoints, the zip lines, a hanging bridge and the waterfall. Most of the high-adventure activities are in this park, so if you only have a day or two, this is where you should spend your time, but it will sport the most crowds. From the town of Santa Elena, plan on taking a taxi for 5.5 kilometers to get to the Monteverde Cloud Forest Reserve. Your taxi will drop you off in a large parking lot with a cafeteria, restrooms and place for (overpriced) souvenirs. Hours and ticket cost: 7:00 AM to 4:00 PM, $20 paid by cash (US or local currency) or a credit card. We recommend getting here right at 7:00 so you can avoid the crowds for a while. The Children’s Eternal Rainforest is the largest — six times the size as the Monteverde Cloud Forest — and is split up into four different stations. You can hike into the reserve to get to your final station, all four of which lead up to an impressive viewpoint. You can obviously spend less time here and only hike one trail, but a full day will give you plenty of times to hike several trails — this cloud forest is typically the least crowded. There’s a $12 ticket entrance fee. Loads of clouds and rain hang around Santa Elena’s cloud forest which creates a magical fog that clings to the dense greenery. There’s a few trails to hike, but we recommend the one that opens up into an impressive view of the towering Arenal Volcano on a clear day. Plan on several hours to hike one trail, more time if you’d like to hike more than one trail. From the town of Santa Elena, it’s 7 kilometers along a bumpy road. You’ll be dropped off in a large parking lot with restrooms, a cafe and some stores for souvenirs before buying an entrance ticket. Hours and ticket cost: 7:00 AM to 4:00 PM, $13 for foreigners. There is a lot to do in these cloud forests. We’re not going to point out the obvious and free actives (just hiking around on your own) because that option is available in all three parks. As a head’s up, things can get a little pricey in this park, which is why some volunteers opt to spend for a big full-day or half-day tour one day, then hike on their own for the second day. Also, we’ve listed a couple of tour companies to give you an idea of what costs may be like; these are not endorsements or recommendations, just a way to give a frame of reference. This is one of the biggest places to zip line, for good reason. 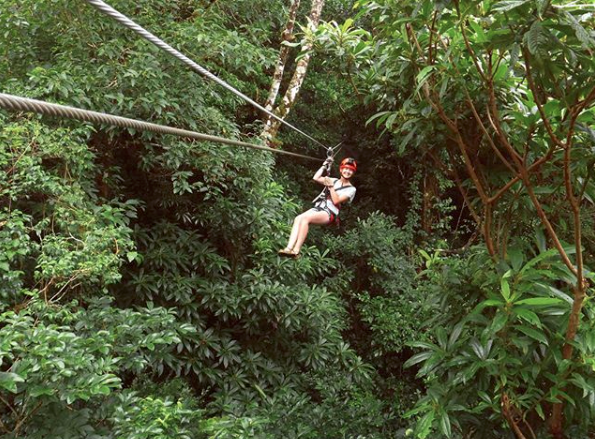 Imagine zooming along 10, or 15 zip lines strung through the green jungle. There are tons and tons of tours that will take you on this thrill ride, with prices ranging from $50 up to $200 or more, depending on what’s included and how long your tour is. Lots of tours have combination options which will include a dreamy tram ride and some hanging bridges. Be sure to read what types of zip lines are included (some let you race, some have you riding down “Superman style” with your head first, etc). Inside the Monteverde Cloud Forest you can hike over five hanging bridges that are dizzyingly suspended over an ocean of treetops. Snap an iconic picture as you’re guided across these high-strung highways. Tours will take you just on the bridges or you can see if these are combined with longer zip lining tours. One company (Sky Trek) has bridge-only tours for $86. If you want a day of spotting animals, you better hire a guide. You may be able to spot a few birds and hear some howler monkeys on your own, but you have a much better shot of seeing animals if you go with a guide. When you buy your entry ticket to Monteverde and Santa Elena’s you can hire a guide. Some guides are even available at night, giving you the chance to spot tarantulas, lime green vipers and the raccoon-like animal like a coatis. Prices range per park. Between the city of Santa Elena and the cloud forests, you can visit a butterfly garden, giving you chance to hang out with some iridescent beauties for around $15. You can also visit the hummingbird garden if you’d like. Some tour companies (like “Enter Costa Rica”) has an option where you can zip line, try out the Tarzan swing and head to both of these gardens for around $65. 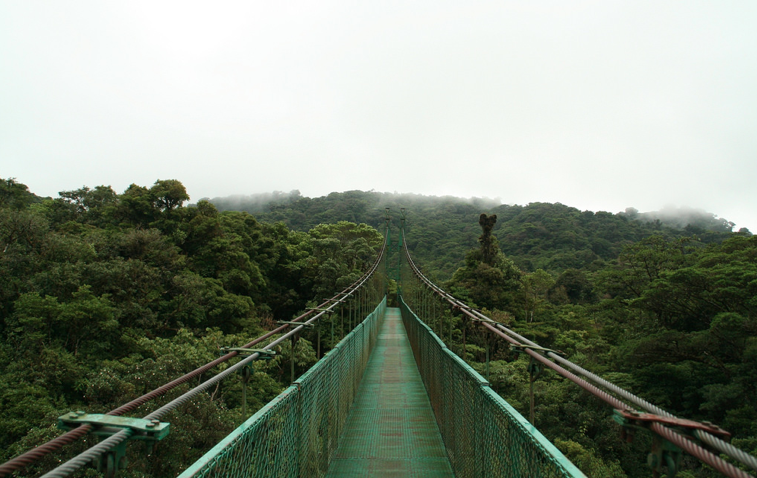 Monteverde Cloud Forest gives you the chance to leap off a platform and swing through the jungle, just like Tarzan. You’ll be strapped in but that probably won’t keep you from yelling on the 148 foot drop down … yikes! The swing itself costs $44, but several tours include is as an option if you’d rather go that route. Extremo Canopy Monteverde has booking options where you can choose what you’d like to try out — for example, the Swing Extreme and the Canopy Tour is $89. The cheapest option is via bus, starting from the 7-10 Terminal at the San Jose Bus Station. Look for the Transmonteverde buses. The ride is 4.5 hours and costs $6. The buses leave twice a day, at 6:30 AM and 2:30 PM. It’s not luxurious, but it will get you there. You can also take a shuttle. Shared shuttles cost about $53, and take around 3.5 hours. Book one here or talk to a hotel or hostel. These shared shuttles leave at 8:00 AM and 2:30 PM. You can also hire a private shuttle which costs around $175 per trip (not bad if you split it with your ILP group — the shuttle can hold up to six people). You can hire a taxi or you can take a bus — From Santa Elena Town to the Santa Elena Cloud Forest, pay $2 for a bus (it leaves at 6:30 AM, 8:30 AM, 10:30 AM and 12:30 PM and returns at 9 AM, 11 AM, 1 PM, 3 PM and 4 PM). From the town to the Monteverde Cloud Forest, pay about the same — this bus leaves at 6:15 AM, 7:30 AM, 1:20 PM and 3 PM and returns at 6:45 AM, 11:30 AM, 2 PM and 4 PM. The Sunday service is at 6:15 AM, 1:20 PM and 3 PM and returns at 11:30 AM, 2 PM and 4 PM). Close to a bus station and supporting some gorgeous views from the lodge windows, Cabinas Vista al Golfo hostel also has a free breakfast. Yum. Another ILP group stayed at the Sloth Backpacker hostel which has a fantastic breakfast, and a pretty central location. Pack a waterproof jacket — even if it’s no the rainy season, it rains a lot in this part of the the country. A waterproof backpack or dry bag is also a good idea. Wear hiking sandals or boots — it will probably be pretty muddy, and tennis shoes will get soaked! Call/email the company you may be booking with if you’re zip lining in the rainy season. If it is storming too badly, they won’t be doing tours. Bring a jacket and longer pants (can get chilly even in the dry season - the higher elevation makes it cooler than the coast). Groups said 4 days was too long in Monteverde, unless you spent some time in nearby La Fortuna. Others said they loved having 4 days to play in the jungle. Ready for a trip to Costa Rica?